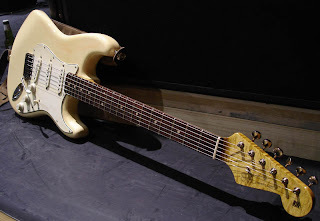 In my previous post I mentioned Matt Schofield's SVL Sixty-One Strat -- a travel and tour replacement for his beloved and valuable '61 Fender Stratocaster. Great looking strat, but the old '61 strat is more to my liking. Compound radius is a bit of an oddball choice for a bluesman, is it not? What's wrong with vintage specs? I think the newer crop of bluesmen are into lower action and playability. I suspect many of them were former shredders who were used to low action -- just my theory, so don't quote me. The vintage 7 1/4" Fender radius combined with low action tends to cause the string to choke when bent. The reason behind the compound radius is to provide better bending whilst up the neck, sometimes the old 7,1/2" radius will choke out on big bends even with a higher action, i'm currently liking 7,1/2" - 9,1/2" compound, you dont even notice the difference but it's way cleaner sounding on beneds up the neck.